Nearly all insects lay eggs and the size, shape and location of the eggs can help identify which species the eggs belong to. The female may lay eggs individually or cluster them together. You may encounter insect eggs, either individuals or masses, inside your home, on your vegetable plants or in other places. Egg shapes vary greatly, from tapered, bullet-shaped eggs to small, spherical eggs. Many eggs resemble small grains of rice, as well, in both color and shape. Most insects begin life as a single, independent egg through a reproductive process known as ovipary reproduction. Most female insects manufacture the eggs within their bodies and, at the correct time, deposit the eggs singly through their ovipositor, or a long, tube-, saw-, or blade-like appendage. Female insects deposit their eggs near or on the larval food source, which may be plants, carrion, dried goods or another insect. The eggs hatch into either larvae or nymphs, depending on the individual insect species' life cycles. Several pests prefer indoor habitats and, unfortunately, love to feed on some of the same stuff you do or some of the items within your home. House flies, for example, lay their eggs -- clusters of 100 or so -- in garbage, sometimes in the home. Their eggs are just under 1/16 inch long, elongated like rice with blunt, rounded ends. Flea eggs and bedbug eggs look like very small -- 1/50 inch -- grains of rice. Lacewings, which are powerful beneficial predators with an appetite for aphids and other pests, lay their eggs individually on the undersides of leaves or plant stems. Each of the rice-like eggs is individually attached to their own hardened strand of silk. 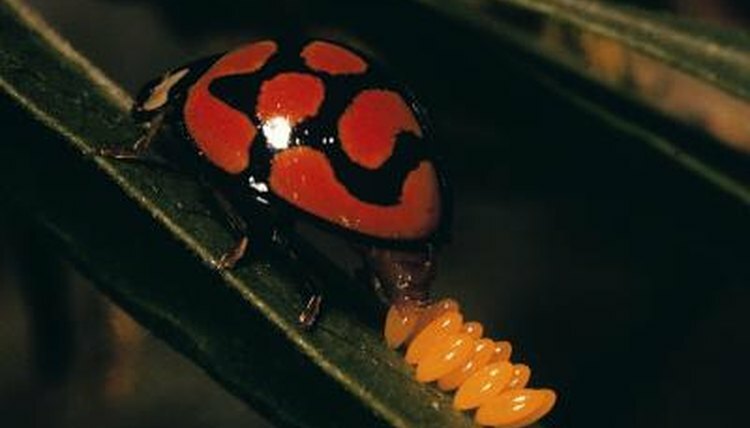 Ladybugs, another type of beneficial predator, lay masses of yellow, rice-like eggs on vegetation near prey populations. Certain moths also lay their rice-shaped eggs on vegetation; tomato hornworms eggs are very pale green to yellowish in color and laid on upper and lower surfaces of leaves. Other insects rely on different types of food; some insects even go to great lengths to take care of their eggs. Some insects lay their eggs on other insects, including parasitic wasps that parasitize caterpillars. The white, rice-shaped eggs and cocoons stick out from the caterpillar host. Many Hymenoptera eggs, including honeybee eggs, look like tiny grains of rice and are kept in individual cells within the hive or nest.